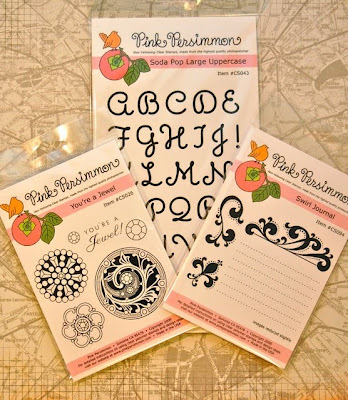 Pink Persimmon Stamps and a GIVEAWAY! I have been following Pink Persimmon stamps for a while now. They are a relatively new stamp company that has some amazing designs! I was drawn in by the vintage/retro/modern look to their images. They are spot-on with with current design trends! And a funny thing happened on my way to reviewing their stamps...I was chosen to join their creative team! :) I never expected to be chosen for the team, but you really can't make it if you don't try out! So I am pleased to be sharing the images above with you today. 1. The stamps are good-quality photo polymer. They are soft, flexible, and stick to your acrylic block easily. Best thing is, once they get too much love and stop sticking, wash them in soap and water, and they are good as new. 2. The images stamp crisply and evenly. 3. Lots of creativity between stamp sets. For this first card, I started with stamping a background on the kraft cardstock using the solid zig zag image from the Banner Set Small. I created the banners by stamping each different pendant pattern in a different color. I glued each pendant to twine and then adhered them to the card. To create the pumpkin, I first stamped the sentiment from Vintage Greetings. Here is a cool thing about clear stamps-you can bend them. The sentiments in the set are curved to fit inside the beautiful scroll image, but I wanted it straight. By placing it on my acrylic block in a straight line, I was able to achieve the look I wanted. How is that for flexibility? The pumpkin and grass images are from two different sets of stamps, not reviewed here, but look at how wonderfully all the images can work together! These next two cards are the same card, with one change, the scroll banner. I wanted to show how amazingly these stamps all work together. The SMALL alpha sets fit inside the scroll! How fun is that? Vintage Greetings comes with several sentiments in great fonts, but if you wanted to customize your scroll, you can easily! I thought this card would be a perfect baby card. But if you wanted to make your own birth announcements, then you could put your child's name inside the scroll, like on the lower card. To make it easier to space your letters out, always start with the letter that is closest to the center of the word. So in the name, Ethan, the h is the center letter. I stamped it first in the center of the scroll. Then I stamped the t and a, and then finished with the e and n. So many possibilities! I guess then my complaint about *needing* more sentiments really isn't justified. I can spell out my own! Be sure and check the website for their other cute alpha set. What do you think? Do you own any Pink Persimmon stamps? What do you think? If you don't yet, what do you think of their images? Which ones catch your eye? What would you like to see more of from Pink Persimmon? Leave your comment and win this wonderful prize package! If you are international your prize will equal in value of a gift card to the Pink Persimmon store. i just love the banner set ... how stinkin' cute!!! I'ven ever heard of them before, but those sure are some really cute stamps. I love that little banner one! So cute! I haven't seen this company before. Thanks for highlighting them. Very cute stamps! very cute! never even heard of them before. all of them are fabulous. i really like the fonts that they used. I don't have any Pink Persimmon stamps, but these are just too cute! I just may be picking some up for myself soon! I adore your projects Kim!! I don't own any of their stamps yet, but I was recently introduced to them through another blog. Love the vintage look of the designs. Thanks so much for the chance to win. I have never seen their stamps before but am very impressed with their designs. I love the banner stamp with all the sentiments that can do inside - too cute! awesome stamps! Love anything with a vintage or retro vibe these days! I had never heard of Pink Persimmons, but I like what I'm seeing. I LOVE that curly alphabet font!! These are simply adorable....I will be keeping my eyes on this company! Thanks for the review...I had not heard of them before, but I will certainly be heading over there to see what they have...the ones you display are super cute! I just heard about these stamps yesterday while watching an online video. I love the banner stamp set. I would LOVE to win some of these stamps!! I love the swirls and florishes!! Thanks for a chance!!! really fun stamps- love the soda pop letters, they remind me of some printing books I have from the 1940's- and I am off to hunt for a set of those mini banner stamps- I could see those coming in handy for every season! thanks for sharing! I really love all of those stamps! Retro/Modern/Vintage is definitely right up my alley! I've never heard of this brand before, so I will be keeping an eye out for it for sure!!! I don't own any Pink Persimmons stamps yet! your cards are great as always. Thanks for a chance to win. I have two sets of Pink Persimmons stamps and I LOVE them! The quality is EXCELLENT! You get the same clear, crisp image that you get from good rubber. And..their designs are fabulous! I just posted a layout using one of their alphabets on Monday, actually! The banner is my favorite, but I like the scroll with the interchangeable messages as well. Nice selection of images and I love clear stamps. Great cards...cute stamps! Love the banner one! I love the style of their stamps and love what you have created with them!!! That banner set is so cute. I'm off to check out their website and see what other yumminess they have! I am not familiar w/ this line of stamps-Love them!! I have to look at their store to see some others now! I don't own any of their stamps, but the banner is so cute!! So cute!! I love the soda pop alpha and some of the images shown on the post here. I have not used these before and they will definitely be on a wish list for me!! I have never heard of this company. I would love to see more from them. I've never had a chance to try these stamps, but they look like tons of fun. Would love to win some. Thanks! These stamps are neat and I have not seen these in my area. They look like a good size to work with and I would love to win them! Oh my, those stamps are just totally tooooo cute! I LUV the Vintage Greetings and Banner sets...perfect for many occasions! I haven't discovered their stamps till now and I've got to get my hands on them! Thanks for sharing! Love the banner set and I agree more greetings. Thank you for reviewing these stamps because I had never heard of them before. They look like they would be soooo much fun! I love the banner making one and the Vintage Greetings is perfect for cards! I love Pink Persimmon! I love the triangle garland!!!! I've heard of them, and I'm definitely interested, especially in the banner. I love what you did with the sets you have, they look like a lot of fun. Will definitely look in at buying them now! Awesome stamps! I'll have to go over and check out this site. Thanks for sharing. I love what you did with the stamps. So cute! I love these sets! So cute. I especially like the small soda pop alpha, I have not seen anythink like it. I saw these on the girlfriend blog. I love there attention to detail all the stamps just have so many uses. I'd never heard of Pink Persimmon, so thanks for bringing them to our attention! I do like these stamps -the banner for the different sentiments is clever, and I can see using these over and over for cards. Thanks for the chance to win! I love Lottie the paper doll stamp on their website. I think it is sooooo cute. I also love their polka dot mushroom stamp too. I've never heard of this company before, but do think that the stamps are VERY cute! Thanks for the info! I have only recently learned of the company. They have a lot of cute sets. Congrats on your position and thanks for the chance to win. I love those sentiments with the scroll. How cute are they! PP has great stamps. I love their Little Red Wagon set, Vintage Cupcake, and Vintage Greetings -- ooo don't forget the banners so versatile. PP has super fun offerings! I really like the looks of their stamps but I am with you, definitely need more sentiments. Most of my cards don't involve images, just sentiments, so that is what I am looking for when I stamp shop. What great stamps! I love the banner...so many creative possibilities. I love all of the stamps but I'm really loving the Soda Pop letters. cute cards too and congrats on the CT appointment!! I've heard of PP stamps but have never used them. I love the soda pop alphabet. Fabulous. I've never seen them before, but they look great. What a cute line of stamps! I love the vintage look--wish I could work with it better than I can, lol! I LOVE the scrolly banner! Sounds like everyone is loving the stamps! Thanks for sharing your thoughts! Thank you for the info on this stamp compnay. I went and looked at all of the nice stamps they have. Have not heard of this company before, but the pumpkins are really cute. Okay-we've established that everyone loves the banner and alpha and they're great for alot of things but what about the Vintage Cupcake? Seeing the clown head brought back SO many memories of childhood birthday parties- thinking I may have to invest in a few of these sets-THANKS for talking about them! I do not own any Pink Persimmon stamps but I did try out for their design team. Their stamps are fabulous, love the banners and cupcakes. Thanks for the chance to win! I was introduced to Pink Persimmon through your blog and have done lots of browsing but no buying -- so thanks for the chance to win! I've loved what I've seen (and your cards are fabulous)! Those banner stamps are a must have! They really do have a cute variety of stamps. I do not own any, but might have to check into purchasing some. I have three sets of PP stamps and absolutly adore them. I love the vintage style, but it's not overdone. Stamps print crisp and I couldn't love them more...I could love more of them though...ha! I love this range of stamps. I think they are so cute! I hadn't heard of Pink Persimmon stamps, but now that I've been there, I think I'm going to have to buy some. I love the personalized banner stamp. So cute! I'm new to this stamp line. I too like the vintage feel to them. Love the banner set and also the journaling set in the prize package. I've never seen banner stamps before. They would be a nice addition.....and your cards are so cute! I have bookmarked to buy their very cute set Little Red Wagon. I LOVE it! And I'm just waiting for them to add more new designs so I can make a big order! I do not have any Pink Persimmon stamps yet so any of the stamp sets would be great! I do like Vintage and think the banners are cute. Inside verses are always useful and sentiments too. Love the banner stamps! How cute is that!?! Very cool Kimberly! Love your cards! Super cute images! I'd love to give this new stamp company a go. I have never heard of this company before, but sure love that banner set, it is toooo cute!!!!!!!!! Very cute stamps. Never heard of them before today, but I'd love to start with this collection! Too cute love the cards and great looking stamps with so many possibilities! Thanks for sharing and love the review. Congrats to you for making the team! WOW - what a great looking catalog of stamps!! I love the vintage look - but those fonts - YUMMY!! The journaling spots are great, too!! These stamps are adorable! Love the banners! Thanks for the review - I've seen the Scottie set on cards here and there, but didn't know where it came from. That set is my favorite! Lots of things I need to fit into my stamping budget! Very cute stamps. I can't wait to check out their website. Thanks! I've never heard of the company before but am so glad to know of them now. Thanks for the review and the chance to win some of their great products. These are cute stamps, I hadn't ever heard of them, but I think it's worth looking in their shop! Thanks for the ideas for the cards. Thanks for the great review, love your samples. I don't have any of these stamps but they look like they have great sets. What wonderful, cute, and adorable stamps! Especially love the banner set. Nice to find new stamps, thanks! I had not heard of this company before, but they sure are cute. Like the sentiments that fit inside the scroll. Thanks for sharing the news! What great stamps! I adore those little banner set!! And that Celebrate card is too cute. I would love to get my hands on some of these.